If you have an Apple iPad or iPhone you might have noticed that all your favorite e-reading apps were not updated for two weeks due to the Christmas holidays and New Years. Everyone in the app development scene is back to work and the Barnes and Noble Nook and Kobo apps have received some big updates. 3D Touch support for iPhone 6s and iPhone 6s Plus. Access Quick Start shortcuts for Search, My Shelves, B&N Readouts, and Current Read from the Home Screen app icon! 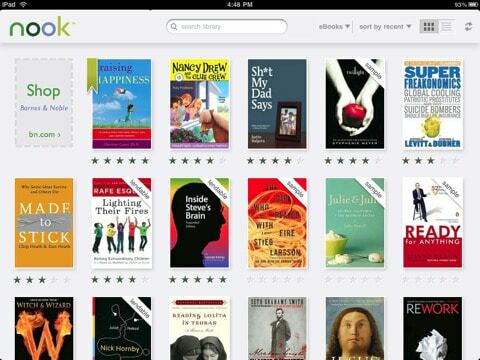 Kobo has issued another update for Kobo Reading App, bringing the app up to version 7.10.2. We’re happy to announce Page Curl is back! Also back by popular demand is our old Author sorting feature.You can still group by Author in your Library, too. Native sign-in for Facebook is now supported. We’ve solved some spacing problems that were appearing on iPad Pro for some users. We’ve also fixed an issue where text size was too small for imported EPUB files. That problem where some items would get deleted if your device ran out of space? Solved! Various stability and reading experience bug fixes.